BeBuzz fans - Have you checked out the BeBuzz 6 Beta yet? Get it today! I've been a longtime user of BeBuzz for BlackBerry and if you love the app as much as I do you may like to know that BeBuzz 6 is currently in beta and open to everyone. 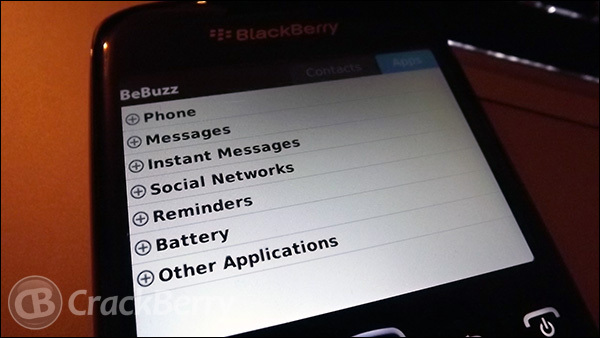 If you haven't heard of BeBuzz, it is an app developed by Bellshare that allows you to customize different LED notifications and sounds for the many different notifications you get on your BlackBerry so you know exactly what is incoming and waiting for you. If you take a click into our forums, you'll find Bellshare themselves have made the BeBuzz 6 Beta available for download for BlackBerry smartphones with OS 5.0 and higher. E-mail, text and BBM filters. Create notifications for specific messages filtered by message sender, subject, body etc. E-mail notifications. Missing notifications while your phone is in the other room? Get an e-mail on your desktop PC when your phone's battery is empty, phone is fully charged, when you get a new BBM or any other notification supported by BeBuzz. It seems like Bellshare is consolidating some of their apps into this one. All for the better I say. Right now the beta release is open to everyone and all new features are fully functional. The beta program will end November 30th. After that, all BeBuzz users who have purchased BeBuzz 5 will get a free upgrade. Bellshare will also be giving away free licenses to CrackBerry users who contribute the most to the test. So, be sure to give feedback and report bugs in the forum post. Bellshare are monitoring that forum post.